Tyre safety has declined in 2014. This is the word from Bridgestone, which was commenting on feedback from its countrywide Tyre Check programme, now in its seventh year. Nakanishi said that the percentage of tyres classified as ‘fine’ (correctly inflated) dropped substantially compared to 2013. In 2013, over 90 percent of tyres were classified as ‘fine’, but this declined to 82 percent in 2014. The highest-scoring survey in 2014, conducted at Springfield in KwaZulu-Natal, returned an 89 percent ‘fine’ rating, but none of the other locations scored higher than 85 percent, and the survey done at Kolonnade Retail Park returned just 76 percent, the lowest score at any location since 2010. “The Kolonnade score is concerning to us, because it was not a small sample. Over two thousand tyres were surveyed during that event,” Nakanishi commented. “This indicates widespread neglect of tyre care in the area, with about one in four tyres in a potentially dangerous condition,” he added. The most common tyre issue found by the Bridgestone Tyre Check team was under-inflation. At each survey, around five percent of tyres were found to be in a severe state of under-inflation; at the Kolonnade survey, almost 17 percent were dangerously under-inflated. Another feature of the 2014 surveys was the number of tyres which were found to be mis-matched, meaning that tyres of different sizes, tread patterns or from various tyre manufacturers were found on the same vehicle. “Mis-matched tyres will affect road-holding and braking characteristics, especially when different tyres are fitted to the same axle”, Nakanishi explained. “Most of the surveys showed a mis-match rate of three or four percent, but the Kolonnade mis-matching rate was 12 percent, rising to 14 percent in the Port Elizabeth survey, he added. Bridgestone said it believed the main factors behind the decline in tyre conditions in 2014 were economic situations. “Tyres are often a grudge purchase, and when times are tough people tend to put off replacing tyres until they have to”, Nakanishi said. “When a tyre is damaged beyond repair, motorists will often opt to replace a single tyre with the cheapest one they can get, even if it’s not the same make or tread pattern as the other tyres on the vehicle. This could be behind the high mis-matching rate we have seen this year”, he commented. He also said that many people neglect tyre maintenance in the daily struggle to make ends meet. 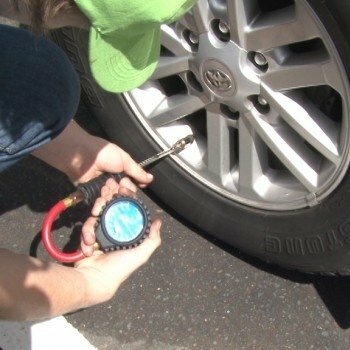 “In fact, regular tyre pressure checks can save your money by making your tyres last longer. Inspecting your tyres could even save your life by preventing an accident caused by a damaged or worn tyre,” he added. “Times are tough, but proper tyre maintenance ensures you get more value for the money you spent when you bought your tyres,” he concluded.